Follow Jeremy and other top freeriders as they travel to the world’s snowboarding meccas and venture past the boundaries of helicopters, snowmobiles, and lifts to explore untouched realms. Hang on tight as Jeremy Jones faces the biggest challenges he has ever encountered in snowboarding. All night hikes, sleeping on peaks, camping 65 miles from civilization, 20 below temperatures, 10 day storms, and 20 mile days bring the adventure back into riding. 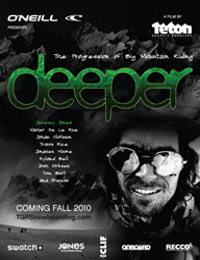 Deeper puts the viewer in the athletes’ boots; from the trials to the tribulations, to mind-boggling breakthroughs in the sport of snowboarding. Tahoe Powder Sound the Alarm Thievery Corporation It Takes a Thief.